Boyle and his American wife Caitlan Coleman made headlines in October 2012 when they were apparently taken hostage by the Haqqani network in a region of Afghanistan controlled by the Taliban. According to Boyle, he and his seven-month pregnant wife were backpacking when they were kidnapped. His story shifted several times since then, saying they were mistakenly in Afghanistan, that they were there as 'pilgrims' to help the local Afghans, and that they were kidnapped because the terrorists thought his wife's pregnancy could be leveraged for ransom from the U.S. Most intriguing is Boyle's apparent continuing support for the Taliban, a legally designated terrorist entity under Canadian law. Boyle continues to refer to the Taliban by their preferred title of 'Islamic Emirate of Afghanistan,' and has even gone so far as to explain that the Taliban refused to cooperate with the Haqqani network in the hostage taking and that the Haqqani thugs tried to recruit him to join with them. Boyle's seeming support of the Taliban remains unchallenged. Boyle first came to public attention in Canada during 2008 protests at Parliament Hill demanding suspected terrorist Omar Khadr's release from Guantanamo Bay. The Khadr family organized the protests, including Omar's niqab-wearing sister, Zaynab. She infamously stated in an interview that the U.S. deserved the 9/11 attacks and dismissed her brother Omar's killing of a U.S. soldier by snorting "big deal." "Canada's first family of terror" is supported by their close connections to al-Qaida (AQ) in Afghanistan and Pakistan and the fact that Osama bin Laden and current AQ leader Ayman al Zawahiri actually attended Zaynab Khadr's previous wedding in Afghanistan. Boyle became the Khadr family's spokesman and, in 2009, he married Zaynab Khadr. The marriage only lasted 18 months. He reconnected with Caitlan Coleman after his 2011 divorce. The bizarre trip to Afghanistan and abduction took place the following year. The couple had three children while in captivity, claiming that one other died following a forced miscarriage. We now know that the Boyle's rescue occurred in October after U.S. Special Forces located the family and told the Pakistanis to secure their release or the U.S. forces would do it themselves. Canada was advised of the operation once it had commenced. Boyle's oddity started immediately when he refused to allow his family to board a U.S. plane, apparently because he feared his Khadr links would send him to Gitmo. After a short delay, the family took commercial flights and returned to understandably huge media attention. Since his return, Boyle has given multiple interviews which can be summed up in this revealing comment: "In the final analysis, it is the intentions of our actions, not their consequences, on which we all shall eventually be judged." "Incidentally, not our first meeting with @JustinTrudeau, that was '06 in Toronto over other common interests, haha." Why would the Canadian PM meet with a supporter of a legally designated terrorist entity that has killed Canadian soldiers? What does that say to Canadians, including family members of other Canadian hostages murdered by Islamists, with whom he has refused to meet? And what is the 'common interest' from 2006 that Boyle is referencing? Did Trudeau meet with members of the Khadr family, including Zaynab, during the protests that year? If so, is another $10.5 million payoff coming for the Boyles? The alleged crimes began a day after the family returned to Canada and lived with his parents, and continued through the end of December, when Ottawa police responded to a complaint. Reportedly, 14 of the charges involve an adult woman, while a child also is an alleged victim. 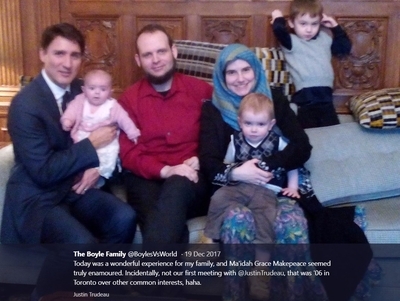 Interestingly, Boyle's wife's parents were in Ottawa visiting with their daughter and grandchildren when the complaint that led to the charges was made. Boyle has had four court appearances but has yet to enter a plea as his lawyers are apparently trying to arrange an acceptable bail release. He'll be back in court Jan. 26. Is this case going to be resolved by a plea bargain?